Quality is such an easy-to-understand thing. It is an improvement in performance above and beyond the ordinary. Since the 1980s, every internal corporate business function has found a way to measure the quality of its outputs, whether they are products or services. There is no debate among corporate executives and managers in other functions about the need to measure output quality, because their customers and partners demand quality. And in many cases, government regulations even require that the quality of the output be measured. The sole remaining functional corporate holdout that has resisted measuring output quality is HR. And the worst offender within HR is recruiting, which is the focus of this article (and features prominently in ERE’s fall conference). Other business functions from production, customer service, supply chain, and even maintenance have found a way to both define and then measure the performance of their provided services. Most business functions have even gone so far as to measure quality at a Six Sigma level, which is an astonishing low 3.4 errors per 1 million actions. With Six Sigma being the gold standard, if recruiting did measure quality, it appears that it would only reach a painfully low 1.6 Sigma level (One study reveals the hiring failure rate within 18 months to be 46 out of 100 hires, and another found that 50 percent of hourly hires will quit or be fired within six months). It is simply unprofessional to assume that your function is automatically producing a quality output without actually measuring it. Only 58 percent of recruiting departments report measuring quality of hire, but when you look closely, less than half of those actually measure new hire performance on the job (the No. 1 quality factor that must be measured). In a world where “quality is job No.1,” recruiting is unemployed! The output goal of recruiting should be to increase new-hire on-the-job performance by a measurable percentage. By proving that new hires perform at a rate of say 5 to 10 percent higher (compared to last year’s hires), recruiting can then easily calculate its total yearly revenue impact in dollars. At a company like Apple, a mere 10 percent improvement in the performance of a single new hire generates an extra $229,000 in revenue each year (just multiply its average yearly revenue per employee of $2.29 million by 10 percent). For 100 new hires, that’s an extra $22 million that would be generated and nearly $230 million added with only 1,000 better-performing hires in a year. No matter how high your “cost per hire” amount is, recruiting better performing hires has a helluva ROI! And improving new-hire performance is thus a good supporting argument for requesting more budget. The second essential reason for measuring your quality of hire is that it allows you to continually improve the process that generates that output. Any continuous improvement process expert (i.e. Kaizen) will tell you that the only way to “validate” each of your process components is by finding out the common factors that were present when a high-quality product was produced and which were absent when a lower-quality output was produced. Obviously without a measure of output quality, you can’t identify the “root causes” that hinder process performance. In recruiting, that means (and often it’s a legal requirement) that you validate critical process elements including your hiring criteria, the best sources, accurate candidate screening processes, hiring manager performance, the best interviewers, and offer closing process. Fortunately with a quality measure as a benchmark, simple statistical methods can reveal which process elements make the largest contribution to success (hiring above average performers). Unfortunately, firms never seem to ever find the time to validate each of the components of its hiring process. The one exception, Google, in its validation effort showed that its well-established screening criteria like grades and unstructured interviews simply didn’t make any contribution to producing higher-quality hires. Simply put, if you don’t identify what process components have an actual impact on output quality, you’ll never know which process components accurately predict on-the-job success. If you’re looking for a quality of hire measure that takes little time, money, and statistical expertise, consider this four step simple model. Survey hiring managers on new-hire performance — in an electronic survey, simply ask each hiring manager to provide their performance assessment of their recent new hire. Ask them at time of hire, at 6 months, and at 12 months, to simply rate each new hire on a 1-10 performance scale, where five is the average on-the-job performance for a new hire in their job family and 10 is an exceptional performer. Sometimes the “would you rehire?” question is the least painful way to judge new hire performance. So consider an alternative approach, which is to ask a simple, “would you re-hire them?” question to their hiring managers (where one means you definitely wouldn’t re-hire them based on their performance, five means you would probably re-hire them, and a 10 rating means a definite re-hire decision with no hesitation). If you want to get even more sophisticated, you can use the new hire’s performance appraisal score, individual new-hire error rates as a representation of their on-the-job performance. The gold standard, of course, is to use individual performance data that covers volume and quality. Did they quit? — after 1, 6, and 12 months, check the voluntary turnover of new hires and compare that turnover rate with last year’s (from within the same job family). Were they fired? — check to see if the new hire was forced out or was fired within 12 months. And compare the firing rate results from last year (from within the same job family). Now determine what predicts performance and what doesn’t — once you have established that you have top-performing hires in each job family, you can then go back and statistically identify which of the hiring process components (selection criteria, sources, hiring managers, interview questions, etc.) that the top-performing hires had in common and that the poor performing hires did not. Obviously you would want to reuse the factors that best predicted new-hire performance and fix or abandon the ones that didn’t predict on-the-job success. If you listen to people who claim to be experts in recruiting, from the arguments that they present, you would think that measuring output quality was an insurmountable obstacle. Obviously experts like JD Power and Consumer Reports would disagree because they have somehow found a way to measure product quality and even service quality in areas that are much more complex than recruiting. Below you’ll find some of the most common arguments against measuring the performance of new hires, and why each one doesn’t hold water. We can’t define quality — it’s ridiculous for professionals running any modern business process to publicly state that they can’t define what a quality output is. Much more complex processes including production, supply chain, aircraft maintenance, and even medical processes have found a way to define a superior process output. Yes, there are multiple aspects of quality to consider in recruiting. But if you focus on newhire on-the-job performance, there are only three basic ones to worry about: 1) on-the-job performance; 2) retention; and 3) hires who must be terminated. And none of these rise to the level of difficulty that couldn’t be easily defined by a black-belt quality control expert. 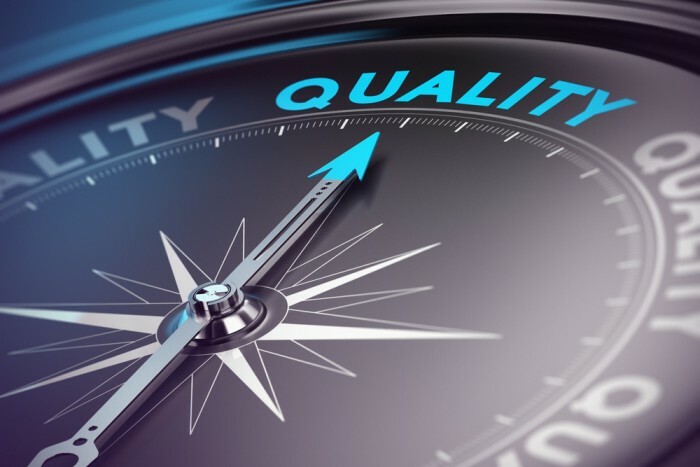 Measuring quality is too time-consuming & expensive — the argument that it’s too difficult and time-consuming to calculate quality is another specious argument for a mission-critical process that continually supplies the organization with its lifeblood of talent. I can cite dozens of cases where a single “Homer Simpson bad hire” cost their firm millions and just as many where a single innovator hire (i.e. Tony Fadell at Apple) literally made the firm billions. A corporate hero, Steve Jobs, found that a top-quality hire produced 25 times more than an average hire, so, yes, the quality of hire matters. Even for a single mid-level hire, the company will likely invest over $100,000 in their first year’s salary, training, and hiring costs. So it makes no sense not to measure whether that significant new-hire investment produced an employee who met or exceeded performance expectations. Recruiting leaders somehow find the time to measure the cost of hire (an insignificant but still complicated success measure), but they never get around to calculating the measure with the highest potential impact, the quality of hire. We don’t have total control — recruiting doesn’t have total control over hiring, but it does design and own the hiring process. And as a process owner in the corporate world, the owner is held responsible for measuring the output quality of the process. Most other corporate processes also rely heavily on managers to execute it, but most process owners long ago realized that “you can’t blame your customer” for bad process results. HR professionals simply aren’t good with numbers — that may be the most accurate counterargument, but unfortunately, it’s still not a good one. In a business world dominated by numbers and dollars, you simply shouldn’t have anyone on your HR team who doesn’t understand metrics in general but measures of quality in particular. The level of metrics that you need for measuring quality of hire is so basic that you might only need the help of a single Six Sigma or quality control expert to measure the performance of your new hires. And those experts probably already work at your firm in the production or quality control areas. The raters of quality are subjective — ratings made by people are subjective, and as a result, they do vary. However, every other business function has found a way to identify and account for some degree of human variation. In recruiting there are of course statistical ways for “normalizing” subjective hiring manager and candidate judgments. After on-the-job performance, the two key remaining new-hire factors are retention and firing rates, which are not subjective. And finally there is a way to avoid most subjectivity related to measuring performance if you start off with the jobs that are already quantifiably measured every day. Those already quantified jobs include sales, customer service, call center jobs, and even most engineering jobs. And for the remaining jobs, it simply makes no sense for the HR department that runs performance appraisal not to push to have the output of every major job quantifiably measured. Data issues — everyone who calculates metrics has “data-issues,” but recruiting is No. 1 at overdramatizing theirs. With a relatively low volume of hires, we are not talking about “big data” here. And with only three data sets in my simplified model (hiring manager assessment of quality, retention rate, and “fire rate,” an Excel spreadsheet will do for most firms. And if you (as some are) worried about small sample sizes, realize that sample size is relevant only when you are sampling from a total population. If you measure the performance of every new hire, you eliminate most sampling issues. And once you establish a baseline standard for a quality, you can use it for a significant period of time. If you use agency or executive search recruiters, it makes sense to measure the on-the-job performance of the new hires who they provide your firm. If you use recruiting process outsourcing, you should also demand that they work with you to provide proof that they are providing above average performers. It’s time for recruiting leaders to face the reality that the “measuring quality” problem has been solved by every corporate functional area except recruiting. Hotels, restaurants, airlines, and automotive manufacturers have also found a way to accurately measure the performance of their product/service. And even Denny’s measures quality with a customer comment card on the table. We have come up short in many areas but perhaps the hardest to understand is “the failure rate of new hires” (which is the new-hire performance area that is easiest to measure). Measuring the number of new hires who must be fired is easy because there are so few of them, but it is at the same time critical because “bad hires” can do a great deal of damage. Next measuring the turnover rate of new hires is also quite easy and objective. Rather than attempt to get actual performance data, at least initially use the hiring manager’s assessment of their own new hires. I would specifically avoid commonly proposed metrics like quality of applicant, candidate/hiring manager satisfaction, time to productivity, and training hours required because these are not actual year-end on-the-job performance measures. Next you simply need to validate each of the components of your hiring process to determine which ones actually contribute to finding and selecting better performing hires in each of the firm’s critical jobs. And finally after conquering “the measuring quality issue,” recruiting should work with HR leaders to help them also move into the 21st century of the measurement. The time for excuses is over, and it’s no longer acceptable to whine about how difficult it is to measure new hire quality, when everyone else has found a way to measure quality long ago. And by the way, if it takes longer than six months to develop a measuring process, you are part of the problem.